Jason posted on Citybar/City8.com last summer, and I thought I’d give a little update because I love it. City8 gives you a beautiful high res full-screen photo of the place you choose, which you can navigate for a 360 degree view, move closer and farther, annotate, and see others’ annotations as well. (Tip: click on the middle of the green nav tool. It will take you to full screen. Wait for it to resolve). The short video (in Chinese) on their homepage with “Little C” shows you what the site can do. You can follow it even if you don’t speak Chinese (there’s a City8 English tab at the very bottom of the page but it only allows you to search in Shanghai and Beijing, and it has much less functionality than the Chinese version). 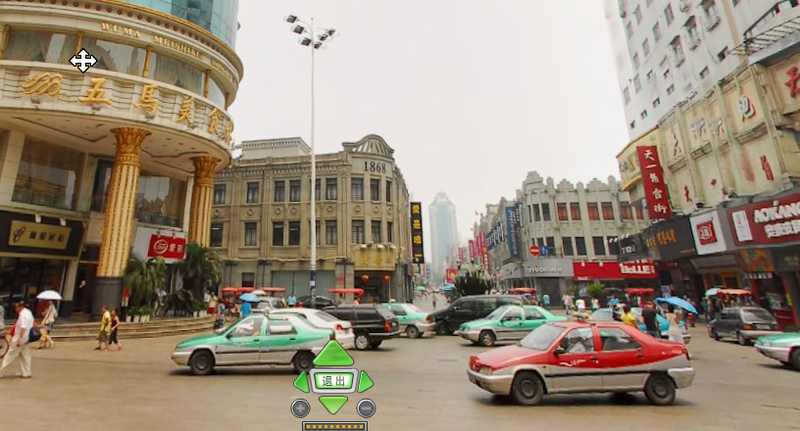 At the home page you can click on the images of 8 different cities (Shanghai, Beijing, Shenzhen, Guangzhou, Hangzhou, Suzhou, and Jinan and Wenzhou of all places) and just play with the locations they give you (places to eat, tourist spots, places to shop). The site is also searchable by street or keyword. You can also enter your own spot to see what’s there. You can drop into, say, the Five Horses Mall in Wenzhou and get a pretty good feel for what street life looks like in Wenzhou on a nice day. Great stuff! Ran across your web site and I think it is absolutely fantastic. I have posted a link to you guys. Great job. Awesome program here. Job well done! I am used to this site to pre-view my destination before my tour. It’s quite facinating. But today, it can not work well. Not sure about the reason…may be due to newwork or your server. Anyway, it’s great and thanks for your good work.